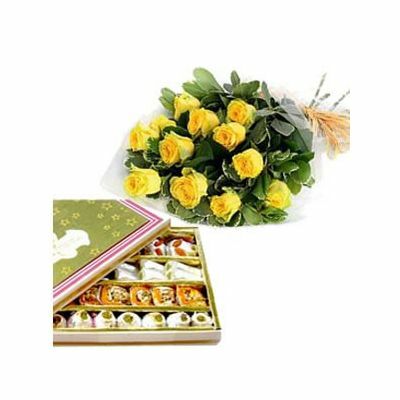 Send this sweet combo consists of 1Kg assorted Kova sweets and 12 Yellow Roses bunch. Assorted Sweets n Flowers, is a special gift hamper well suited for festivals and special occasions. It consists of a dozen brilliant yellow roses set beautifully in a bouquet by our florist. The yellow roses and green leaves make a pretty picture and together with one kg of assorted sweets, it makes a wonderful gift hamper. Send roses bouquet online to your dear ones on festivals and special events such as anniversary, graduation, baby showers and other happy occasions. This gift hamper makes a great thank you gift too.